It is often stated that Armenian language has gone through “major” changes throughout its existence. Although there are plenty of indications to reveal several changes in its grammatical paradigm and etymology, however, there is no evidence of “major” changes that would indicate anything other than the normal evolutionary process of a mature language. Surprisingly, considering the documented historical journey of the speakers of the Armenian language, from division of the Armenian homeland and the people by different empires, to dispersions, persecutions and destruction of the monasteries that were also centers of higher learning and custodians of the cultural patrimony of Armenians, the language not only maintained a remarkable steadiness but was able to retain its characteristics in spite of the odds as well as evolve and further develop the fundamentals of its grammatical structure and enrich the etymological components of its vocabulary. One of the yardsticks to measure the evolution of a language is to catalogue the changes of its etymology and grammar. The footing of the time lapse to quantify the changes is a cycle of 500 years while the computation of the evolution of the components of a language (grammar and etymology) is in terms of the percentage of the changes within the cycle where the ratio of up to 10% change is considered to be the pace of a normal evolution of a language. 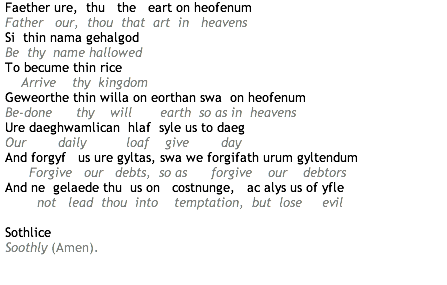 Were it not for the literal translation in italics, one might not have been able immediately to identify the text above as being the Lord’s Prayer. The text in Old English was still used in England during late 15th century. Compared to Modern English, it is fair to state that all aspects (syntax, grammar and vocabulary) have gone through significant changes. The Armenian text of the Lord’s Prayer, written in the early periods of the 5th century (circa 425) does not require any translation since the basic vocabulary has not changed and it is still used today. The only modifications, if the text were to be written today, would be the application of modern cases of the declension. Yet, an average command of Modern Armenian is enough to fully understand the original text composed 15 centuries ago. We should not be quick to conclude that Armenian language is frozen in time or stagnant. The remarkable stability of its etymological base is only a proof of the maturity of a language. Today, advances in science and technology are challenging linguists to keep pace with technology and the contest to create new words or redefine the existing words. A belated reaction by linguists often causes the proliferation of loan-words in languages world-wide and sometimes leading to serious debates in different parts of the world on language and culture. Even rich and mature languages are not indifferent. The debate on language in France is a good example. At the turn of the 20th century, there was a significant number of literary works that were translated from English, Russian or French into Armenian. An imaginative Armenian translator ended up coining over 1000 words while translating the romantic novel. Only time will tell if any of his words will survive the test of endurance. Words are the leaves of the tree of language, of which, if some fall way, a new succession takes their place.